Yesterday we posted a challenge on our Facebook Page. Which one cost more? The answer might surprise you! Read on. Do you have a mantle or alcove you need to decorate? The team at Bliss Blooms was tasked with decorating this impressive eight-foot limestone mantel at the University of Texas Golf Club with candles and all white blooms to create a stunning grand entrance to a fabulous event. White pillar candles of varying heights were staggered along the length of the mantel. Roses and hydrangea, placed in clear water tubes, were nestled around the candles with the fig leaves and dripping amaranthus. 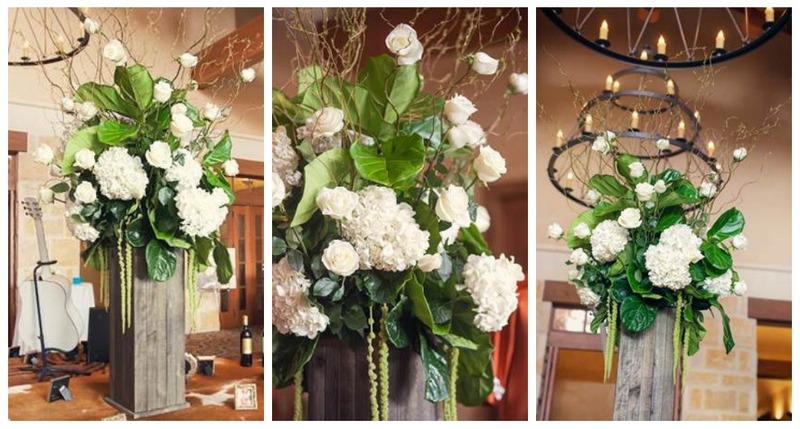 To achieve an impressive statement piece that soared to the chandeliers in the clubhouse dining room, we started with a 3 foot tall barnwood vessel, lush fig leaf branches, luxurious jumbo hydrangea, sprouting 5 ft willow branches and hanging amaranthus. Long stemmed roses brought the arrangement to life and rose heads were wired to the willow tips for the finishing touch.